Mobility has never looked so good. The Pub Chair PR-712 provides the assistance you need to sit and stand with ease all in a classic design that will look great in any home. No detail has been overlooked in creating this sophisticated chair. From your choice of rich fabric colors to decorative brass nail head trim, the Pub Chair PR-712 represents the pinnacle of lift chair style. In addition to an unbeatable form, this model also showcases the best in function, including SmartTek diagnostic technology, an AutoDrive remote control and patented MaxiComfort recline capabilities. 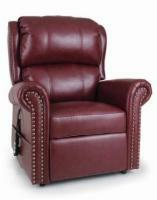 The latest in lift chair technology has gone into creating a chair that offers comfort, style and performance. Call today to speak with a friendly lift chair expert who can answer all your questions.